It is done. The book is finally done. 1. I really enjoyed the style of this book. It was a collection of diary entries and letters from lots of different people, but mainly Octavian Nothing. 2. This book gives a very interesting perspective on the Revolutionary War. Most of my readings from this era are from the (white) revolutionists, so it was interesting to read a fictional account of a slave in the British Army. This book has inspired me to do more reading on this era in the US's history. 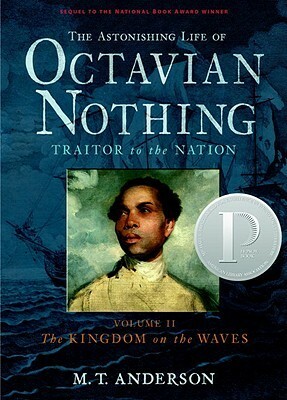 The Astonishing Life of Octavian Nothing, Traitor to the Nation, Vol II: The Kingdom on the Waves followed the same format as The Astonishing Life of Octavian Nothing, Traitor to the Nation, Vol I: The Pox Party; however, the second volume did not have the same Gothic feel that the first volume did. Even though I was not a huge fan of the first book, the horror elements kept me going, this book dragged. Sign into Goodreads to see if any of your friends have read The Kingdom on the Waves. 9.0% "I gotta find out what happens Octavian." 25.0% "Things are looking up for Octavian, for the moment at least." 37.0% "Poor Octavian. At least his friend is okay for now." 52.0% "I want good things for Octavian, but I also know how this war is going to turn out..."
64.0% "Slow moving, but I will finish this book." 78.0% "I don't think things are going to end well for Octavian."